Senate Majority Leader Harry Reid (D-NV) set Wednesday, May 16 as the date for a "test vote" of immigration reform legislation, beginning the Senate's effort to approve comprehensive immigration reform legislation in 2007. The Senate vote will consider either the reform bill passed by the Senate last year or, if completed in time, a compromise reform bill hammered out between Republican and Democratic senators and two senior White House officials (see sidebar for overview of events leading up to the test vote). After months of negotiations, a bipartisan group of senators working with Department of Homeland Security (DHS) Secretary Michael Chertoff and Commerce Secretary Carlos Gutierrez was still finalizing details as of May 15 for a new immigration bill. Senators established agreement on a number of general provisions, including the need for some type of legalization and temporary worker programs, and certain "triggers" that should be achieved before a temporary worker or legalization program could begin. These triggers would involve an increase in the number of Border Patrol agents from 12,000 to 18,000; fences along the border near certain metropolitan areas; implementation of a mandatory electronic verification system to check an individual's authorization to work in the country; higher fines for employers found to have unauthorized workers; and a new point system for allocating employment-based permanent visas. Senators and the Bush administration were still negotiating over whether temporary workers should have a path to permanent status or be able to bring family members to the United States, what types of penalties unauthorized immigrants would face before being offered legal status, and whether the family-based permanent visa system should be reconfigured. Senators John McCain (R-AZ) and Edward Kennedy (D-MA) begin formulating a new comprehensive reform proposal. President Bush includes immigration reform in his State of the Union address, renewing his call for a temporary worker plan and a path to legalization for unauthorized immigrants. Senate Majority Leader Harry Reid (D-NV) vows to "take up a bill before the August recess." Attempts to introduce a bill in the Senate falter, and Senator Kennedy proposes using legislation produced last year by the Senate Judiciary Committee as a starting point for negotiations. Group of GOP senators begins meeting with DHS Secretary Michael Chertoff and Commerce Secretary Carlos M. Gutierrez to craft a Senate immigration reform bill. Senators John Cornyn (R-TX), Arlen Specter (R-PA), Jon Kyl (R-AZ), Mel Martinez (R-FL), and Lindsey Graham (R-SC) are among those looking to create a united position among Republican senators. On the House side, Representatives Luis Gutierrez (D-IL) and Jeff Flake (R-AZ) introduce the Security Through Regularized Immigration and a Vibrant Economy (STRIVE) Act. White House immigration reform principles leaked to press. President Bush reaffirms his push for comprehensive reform that, in addition to improved border and interior enforcement, includes "resolving without amnesty and without animosity the status of the millions of illegal immigrants that are here right now." Majority Leader Reid sets a deadline of May 14th to begin debate on an immigration reform bill in the Senate. On the House side, Rep. Zoe Lofgren (D-CA), chair of the Judiciary Subcommittee on Immigration, Citizenship, Refugees, and Border Security, embarks on a series of hearings on immigration reform components. A meeting between Republican and Democratic staff ends abruptly when negotiations turn sour, causing Republican staffers to walk out. Senators decide they will negotiate in person to overcome the stalemate. Majority Leader Reid vows to bring the immigration bill that passed the Senate in 2006 to the floor and bypass the committee process, unless a reasonable alternative to the bill is proposed by May 14th. Senators scramble to reach consensus before the May 14th deadline. Key Republican senators, including Lindsey Graham (SC), Mel Martinez (FL), John McCain (AZ), and Arlen Specter (PA) threaten to vote against last year's Senate-passed bill if brought to the Senate floor. 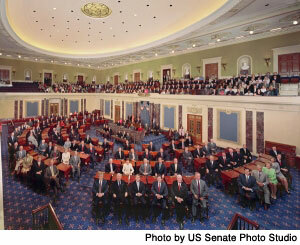 Senators urge Reid to allow time to finish negotiations and introduce a new bill. Reid finally relents and postpones the vote until the 16th. In the House, subcommittee hearings on immigration continue. President Bush uses his May 12th weekly radio address to continue his call for comprehensive immigration reform. Negations broke down in May between the United States and Canada over a plan that would have permitted U.S.-bound land travelers to pass through immigration and customs inspection while on Canadian soil rather than after crossing the border into the United States. The plan, known as the "land preclearance pilot project," is aimed at reducing congestion at land-border crossings, particularly at the Buffalo-Fort Erie crossing where there is no room on the U.S. side to expand inspection facilities to reduce traffic congestion. Travelers from Canada to the United States already pass through immigration and customs preclearance inspection at a number of Canadian airports. As part of the current and proposed preclearance programs, foreign nationals traveling to the United States from Canada, except for Canadians who do not hold a visa, are required to submit fingerprints under the US-VISIT program. With airport screening, individuals subject to US-VISIT can decide to abort their travel plans and avoid submitting fingerprints. However, under the land preclearance program, U.S. officials want to require fingerprinting of even those travelers who decide not to go through with the preclearance regimen because of security concerns. Canada objected to this requirement because it does not comply with Canadian civil rights laws, which allow only voluntary collection of fingerprints from individuals not charged with any crime. Despite the breakdown in negotiations, Canadian officials "remain committed" to exploring preclearance plans within the parameters of Canadian law. Read a Public Safety Canada press release here. Senator Hagel's Immigration Bills. Senator Chuck Hagel (R-NE) introduced two immigration reform bills, the High-Tech Worker Relief Act and the Immigrant Accountability Act, in April. The High-Tech Worker Relief Act would increase the number of H-1B visas for high-tech and other skilled workers from 65,000 to 195,000 to address severe shortages. The Immigrant Accountability Act would award temporary status to unauthorized immigrants meeting certain criteria. It also would create a merit-based point system that would allow these immigrants to obtain a green card once they earn enough points. Points would be awarded for characteristics that demonstrate investment, contribution, and assimilation into the United States. The point system is modeled on systems in Canada and Australia. Read a press release from Senator Hagel on the Immigrant Accountability Act here. Stolen Passport Database. DHS will soon begin using an Interpol database containing information on lost and stolen passports, nearly two years after the database became available. Such passports are seen as a particularly easy way for would-be terrorists to enter the country; one of the September 11 terrorists used a stolen passport to enter the United States. The Interpol system contains data on 14 million passports from 122 countries. DHS was initially reluctant to use the database, claiming better information was available through bilateral agreements. However, such agreements provide access to data on only a limited number of stolen passports. DHS will begin a 30-day pilot of the system at one U.S. airport this fall and will expand the system nationwide if the pilot is successful. Read Congressional testimony by Paul Morris, Executive Director, Admissibility Requirements and Migration Control, Office of Field Operations, U.S. Customs and Border Protection on use of the Interpol database here. Asylum Seeker Swap. The United States and Australia have agreed to exchange up to 200 asylum seekers processed by the other country each year. The agreement is in response to Australian Immigration Minister Kevin Andrews' vow that unauthorized boat arrivals will not make it to the Australian mainland. Through the plan, Australia is attempting to meet international obligations to provide protection for asylum seekers without having to renege on its vow to block boaters from reaching the country. Swap participants will likely include Sri Lankans and Burmese being held at Nauru and Cuban asylum seekers being held at Guantanamo Bay Naval Base. The scheme will be reviewed in April 2009. TPS Extension. The U.S. government will allow more than 300,000 Hondurans, Nicaraguans, and Salvadorans to renew their temporary protected status (TPS) for an additional 18 months, DHS announced on May 2. TPS was awarded to unauthorized immigrants from Nicaragua and Honduras after Hurricane Mitch struck the two countries in 1998; Salvadorans received the protection after two earthquakes hit El Salvador in 2001. All three groups have received several renewals of their TPS. Offered to nationals of a country affected by armed conflict or natural disasters, TPS allows them to live and work in the United States until TPS is removed. The extension is expected to affect 78,000 Hondurans, 4,000 Nicaraguans, and 230,000 Salvadorans. The U.S. Citizenship and Immigration Services press release about the TPS extension is available here.